Squid kids nabbed by thieves. 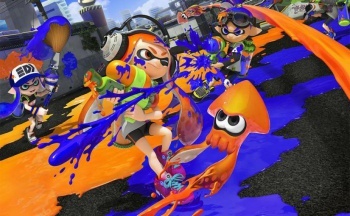 Customers of UK retailer GAME who pre-ordered Splatoon, Nintendo's online multiplayer shooter filled with squids, kids, and paint, received disappointing news today. According to an e-mail sent to customers, a truck which was transporting merchandise from Nintendo's European warehouse to the retailer has been stolen. In the lost shipment was the chain's entire allocation of the limited edition bundle featuring the "Squid Inkling" Amiibo. Due to the theft, GAME will not only be unable to fulfill pre-orders in time for the game's scheduled release on Friday, May 29, but they will not be receiving replacements for the lost merchandise either. This means that nobody will be scoring the Squid Inkling from GAME at all. Ouch. Customers who pre-ordered the Splatoon bundle with the special Amiibo from GAME will instead be shipped the standard version. As an apology for the inconvenience, GAME will also be taking Â£10 off the purchase price of the standard edition. Those who wish to cancel their orders altogether, rather than accept the substitution, will need to contact GAME before they ship out copies midday Friday. Pre-orders of the Boy Inkling and Girl Inkling Amiibo toys will be fulfilled, though they too will be late in shipping.